Without wishing to give away too much about the plot of Willow the Vampire and the Sacred Grove, this blog is really about Willow finding her identity and place in the world. Towards the end of the first book my heroine discovers some important facts about herself together with some new and rather startling powers which, in part two of the series, will be explored further. In order to truly understand who we are, so that we don’t go through life with tunnel vision, we must learn what life is really like for other people and see ourselves through their eyes, too. Just like T H White’s Merlin, who turned Prince Arthur into a variety of animals, I want my vampire heroine Willow to explore other facets of “being”. One of the beings I wish for her to explore in the follow-up adventure is one that seems so utterly inoffensive and yet has many enemies (mainly men with spades). 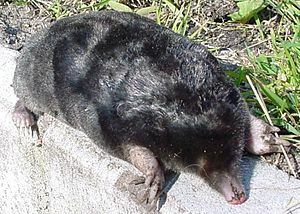 One of my earliest childhood memories revolves around a mole – no, not the kind you find on the hairy chin of your elderly maiden aunt – I mean the kind that burrows deep and upsets Dads by creating mole hills on the manicured lawn outside your house. This wasn’t a random mole though – the mole I remember is a wonderful cartoon character from the Czech Republic and the first animated film I ever saw: The little Mole and the Automobile (or rather in German: Der kleine Maulwurf und das Auto) was made in 1963, if I remember correctly, and it enchanted me so much as a child that I always knew, one day I’d be writing stories for children. Moles are neither nocturnal nor day-time animals as such. They spend almost their entire lives (3 to 5 years) underground in burrows up to 200 m / 660 feet long. These tiny diggers have super-strong forearms, elongated bodies with short legs, tiny, ineffective eyes, inwardly turned ears, a sensitive snout and tail to detect the smallest of quivers from their prey, namely earthworms and other insects. 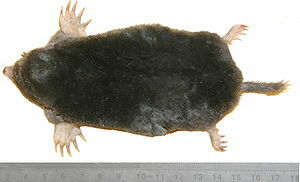 Moles belong to the group of mammals that are called insectivores. What they don’t eat, they store away in their larder – their burrows consist of neat little chambers, such as a sleeping chamber lined with grass and leaves, a storage room for food, a mound on top to keep enemies out and warmth in as well as various escape tunnels to feel safe. The mole hills that used to upset my Dad so much are really vertical tunnels that moles dig in the centre of their burrow – the tunnels serve to air the burrow and to trap insects, which either fall or crawl into the mound. The mole of the Czech animated film was undoubtedly a European mole, but there are also American shrew moles, Star-nosed moles with weirdly shaped snouts, Hairy-tailed moles, river-bank dwelling Russian and Pyrenean desmans, which look like moles with an extra long nose and long tails. European moles have stubbly, short tails and a gorgeous black, velvety coat. In total, there are 29 different species – my favourite one is the Hottentot golden mole, which has got a horny pad on its nose and four clawed toes on each paw with which to dig extensive tunnels – tunnels and mole hills large enough to drive the most stoic of Dads around the bend! Just like Mole in Wind in the Willows by Kenneth Grahame, the little Mole from the Czech Republic’s films is a favourite with children and grown-ups in many countries. When visiting Prague a couple of years back, I spotted to my delight numerous shops selling Mole toys and memorabilia from the animated films. Moles may be most famous for tunnelling underground and rarely coming to the surface, but these two fictional moles at least have taught this particular child tunnel vision is a thing that keeps us from making friends and being happy. I’m hoping that Willow the Vampire will discover that, too. Why not click on the links below and enjoy the short animated film? Go on, allow yourself to be a wide-eyed toddler for a moment!